Hex bolts and hex cap screws feature a large fastener head for distributing clamping load. These fasteners are used at high tensions and temperatures. Cap screws have a washer face underneath the head and are used in precise applications. In Europe, a cap screw refers to a bolt-type fastener that is fully threaded, whereas a bolt is the part-threaded equivalent. 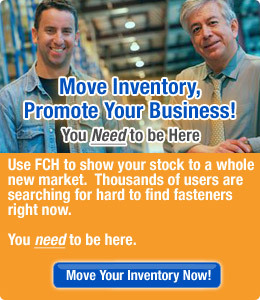 Search thousands of Bolts & Cap Screws in the FCH database of surplus, odd lot, slow-moving and hard to find fasteners. Click one of the links below to find everything from Hex Head Cap Screw to Wheel Bolt from hundreds of fastener distributors. Many FCH Network Member companies sell their Bolts & Cap Screws directly to end users, and others sell only to other distributors. Some list pricing information and some do not. The database is open for search by anyone with an internet connection, however members who login to the website receive additional benefits and more extensive fastener listings.